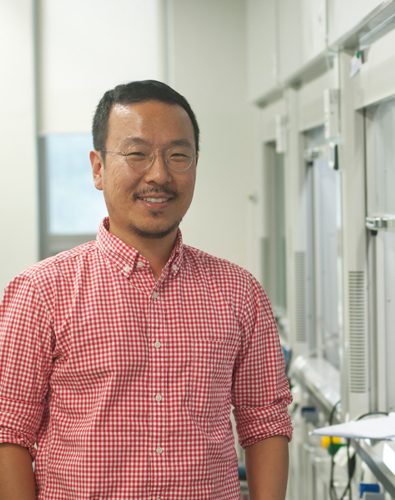 Jung-Min Kee graduated from KAIST (Korea) and earned his Ph.D. from Stanford University under Prof. Paul A. Wender, working on the design and total synthesis of bioactive natural products and their analogs. Afterwards, he was a Damon Runyon Postdoctoral Fellow under Prof. Tom W. Muir at Rockefeller University and Princeton University. There he developed the first antibodies towards phosphohistidine (pHis), enabling the exploration of protein histidine phosphorylation in cells. Since the autumn of 2014, he has been an assistant professor of chemistry at UNIST, focusing on the chemical biology of protein post-translational modifications (PTMs). As a chemical biology research group, our goal is to understand complex biological systems at the molecular level using tools of synthetic chemistry. For this, we design and synthesize novel molecular tools, ranging from small molecules to peptides and modified proteins, in order to provide unique and innovative solutions to important biological problems. In this respect, our research program has three "elements" ? synthetic chemistry, molecular design, and biological applications. In our group, they are synergistically integrated for innovative chemical biology research. 우리 연구실의 목표는 유기합성화학과 화학생물학(chemical biology)의 도구를 이용하여 복잡한 생물학적 시스템을 분자적 수준에서 이해하는 것입니다. 이를 위해, 저분자 물질, 펩타이드, 합성단백질에 이르는 다양한 새로운 분자 도구를 설계하고 합성하며, 이러한 도구들을 이용하여 생물학의 중요한 문제들에 대해 창의적이고 혁신적인 해답을 제시하고자 합니다. 이러한 측면에서, 우리 연구실에서는 유기합성화학, 분자 설계, 그리고 생물학적 응용이라는 3가지의 요소가 결합된 융합 연구를 진행하고 있습니다. Kee, J.-M.; Rob C. Oslund, R. C.; Couvillon, A. D.; Muir, T. W.* Org. Lett. 2015, 17, 187-189. Kee, J.-M.; Oslund, R. C.; Perlman, D. H.; Muir, T. W.* Nature Chemical Biology, 2013, 9, 416.421. Kee, J.-M.; Muir, T. W.* , ACS Chemical Biololgy 2012, 7, 44-51. Kee, J.-M.; Villani, B.; Carpenter, L. R.; Muir, T. W.* J. Am. Chem. Soc. 2010, 132, 14327-14329. Wender, P. A. *; Kee, J.-M.; Warrington, J. M. Science, 2008, 320, 649-652.